Gagarin Project is a collective of conscious artists, music producers, dancers and DJ’s. We explore the realms of mind expanding music, psychedelic grooves for body and soul. Our music are not limited to a certain genre, juggling between ambient, modern psychedelic & bass music, psytrance and techno. Gagarin Project is the international collaboration that has evolved from the ideas of conscious living, kindness and love to other humans, our brothers and sisters. Moreover it’s activity is greatly inspired by the values and traditions of ancient civilizations, universal principles of love, natural and healthy lifestyle. Gagarin Project collective have performed at the biggest festivals all over the Europe, USA, Brazil and Asia. explore more about us and our projects. 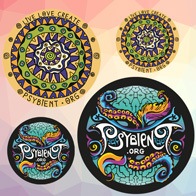 visit psybient.org web portal for chill / downtempo / psytrance music and events. Below you can find some selected sounds of Gagarin Project…. turn on your speakers, adjust volume, sit back, relax and enjoy. Gagarin Project has a side project with Gagarin Beats alias. In the project we explore the dancefloor oriented part of electronic music (techno and psy-techno, minimal, tribal, psytrance, progressive, psybreaks). we create and mix music that is often categorized as psychill (psychedelic chillout), psybient (psychedelic ambient), psydub, dub, psydubient, psystep, psybreaks (psychedelic breaks), downtempo, ambient downtempo, world, ethnic, temple bass, chillgressive (progressive chillout), ambient, ambient dub, psydm, idm, trip hop, glitch, electronica and meditative. It is also sometimes tagged as ethno, tribal, spiritual, meditation, love, dance, rituals, shamanic. one love, we are one!